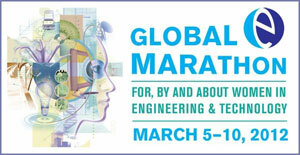 WASHINGTONDC, February 28, 2012– National Engineers Week Foundation’s 8th annual Global Marathon For, By and About Women in Engineering and Technology has announced its agenda. The Global Marathon, set for March 5-10, 2012, is the only event of its kind connecting women in engineering and technology worldwide across a diverse range of disciplines, experience levels, ages, interests, backgrounds, cultures, industries and employers. Originating from a different part of the world each day, this year’s theme is 7 Billion and Counting: Dreams, Ideas and Actions to Change the World. Individuals from corporations, universities, non-profits, community organizations and others will participate in real-time webcasts, internet chats, polling questions, teleconferences and live events. This year, the Global Marathon is moving to a new robust online conference platform that allows a deeper level of engagement and interaction among speakers, virtual attendees and the worldwide community. To register, please visit http://www.inxpo.com/events/GlobalMarathon/Registration/. This kick-off session sets the stage for the week as executive women from both industry and non-profit discuss women making a difference both through their work and volunteerism. Professionals from diverse fields share their perspectives about food challenges–from farming to industrialization to distribution–and their impact on society. This session will be conducted primarily in Portuguese. Sue E. Nokes, PhD., P.E., Chair, Department of Biosystems and Agricultural Engineering,UniversityofKentucky. Leading female engineering entrepreneurs share the personal stories of their entrepreneurial journeys – the failures, the triumphs and the wisdom gained. Dr. Patricia Galloway, CEO, Pegasus Global Holdings Inc. This forum addresses residential energy consumption related to (a) energy efficiency within the home and (b) renewable energy to power the home. Kavita Ravi (Moderator), American Association for the Advancement of Science (AAAS) Fellow at the Office of Policy and International Affairs (PI). The challenge of sustainably managing the world’s water resources has never been greater. This panel discusses how individuals, businesses and governments around the world are taking action and delivering solutions to change the urban water paradigm. Var Hansen, Head of Expeditions, E.quinox, an award-winning non-profit, completely student-run humanitarian project that brings cost-effective, sustainable renewable energy toAfrica. A first-ever opportunity to hear from some of the most influential women professionals leading worldwide engineering societies – together, in one place and at one time. They will recap highlights of the week as well as share their visions for the future. For more information and a complete agenda, please visit http://www.eweek.org/EngineersWeek/GlobalMarathon.aspx. Cindy Kou, Program Director, Lotus Collaborative Productivity Tools, IBM China, serves as Chair of the 2012 Global Marathon. Gayle Gibson, Director, Corporate Operations, DuPont, is Vice Chair. Bechtel, IBM, DuPont, ExxonMobil Corporation, Motorola Mobility and American Society of Mechanical Engineers (ASME) are the 2012 Global Marathon sponsors. Along with more than a dozen regional leaders, DuPont, C3E and American Society of Civil Engineers (ASCE) are among the prestigious organizations partnering with National Engineers Week Foundation to facilitate the daily sessions. The National Engineers Week Foundation works year-round to sustain and grow a dynamic engineering profession critical to public health, safety, and welfare. The Foundation supports engineering outreach, education, and celebration through a network of thousands of volunteers in its partner coalition of more than 100 professional societies, major corporations and government agencies. Together we meet a vital need: introducing students, parents, and educators to engineering, engaging them in hands-on engineering experiences, and making science and math relevant. The Foundation and coalition are actively putting the E in STEM.